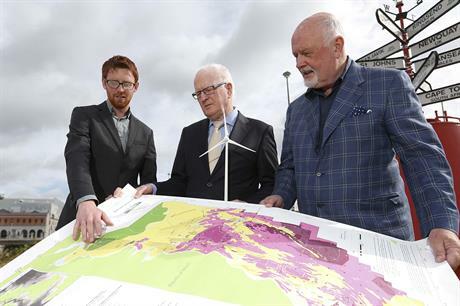 IRELAND: Irish wind developers Oriel Windfarm and Gaelectric Holdings have signed a memorandum of understanding to develop a 15MW demonstration project in the Irish Sea. The 15MW North Irish Sea Array (NISA) demonstration is planned for a site 22 kilometres off the northeast Irish coast. The memorandum of understanding between Oriel and Gaelectric is to invest €80 million in the research and development project. The project location features average wind speeds of 9m/s, with water depths of 15-30 metres. It is understood the demonstration will be the initial phase of the 330MW Oriel offshore project, which has received full regulatory approvals. The entire NISA project has a potential 870MW capacity, which could be installed, in phases, by 2022, the two developers state. Ireland's current offshore capacity consists only of the 25.2MW Arklow Bank project, installed in 2004 by GE and SSE. This site is located ten kilometres off the east coast of Ireland.